Bids for many projects will open in the months of September and October as per NHAI website and we believe that a prominent player like KNRCON will achieve a `Good Luck`. In next 4-5 months, around 80 projects will go underbidding on HAM basis, ranging from 800-1300 Cr each. KNR expects to win 1500 Cr of HAM projects. 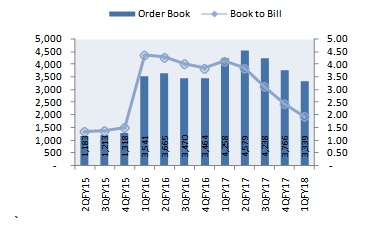 The current order book stands at Rs.3339 Cr and therefore, revenue visibility is at 1.96x TTM. During the quarter KNRCON did not receive new orders for the slow progress in land acquisition and impact of GST on awarding activity. Execution is the key characteristic of infra companies. Superior execution capabilities have given extensive headroom for the growth. Over the last 5 quarters, KNRCON revenue has grown at an average of 70%. Currently, management expects to complete a couple of projects such as Thiruvananthapuram Bypass and Madurai -Ramanathpuram Section of NH-49 by January 2018 and April 2018 respectively. Based on the superior execution capability, we expect 24% revenue growth in FY18 based on the current order book. EBITDA margin was improved by 320 bps to 17.6% as compared with 14.4% same period last year. The claim of Rs.16.81 Cr has helped to post better margin. KNRCON is one of the fastest growing companies in Engineering and Procurement segment. The company undertakes EPC projects in Roads and Highways, Irrigation and Urban Water Infrastructure. 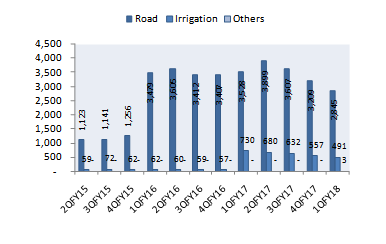 The slow pace of land acquisition and implementation of GST has slowed down the order inflow, which again resulted in NIL order intakes till date this year. But now bids for many projects will open in the months of September and October and we believe that a prominent player like KNRCON will get good chuck out of that. We believe management’s strategy to enter new verticals for keeping the balance sheet light and boosting growth will pave the way for the future growth. The stock has corrected nearly 13% post the Q1FY18 result and we don’t see any substantial downside from here on. Considering the improvement in order inflow outlook, we are positive about the stock and recommend BUY with target price Rs.230. Sandip Jabuani is a fundamental research analyst at Narnolia Research, responsible for covering Industrial sector. He excels in Financial Modeling and is well read on Accounting Rules and other Laws governing sector. He has done a post graduate in Fi..Sandip Jabuani is a fundamental research analyst at Narnolia Research, responsible for covering Industrial sector. He excels in Financial Modeling and is well read on Accounting Rules and other Laws governing sector. He has done a post graduate in Finance.